Ok, so here in the Northeastern United States we have been getting quite a lot of snow. I think Maine has had 25-30 inches of the stuff over the last few days...with more to come. I very much hope that all of my fellow New Englanders are faring well in these storms. The weather has certainly made my week strange--with a mix of snowed-in days and hectic catch-up days--but I did get the chance to spend some time with a very unique action figure doll that I've been admiring for quite a while. I am a relative newcomer to the world of action figures, but lately this style of doll has become increasingly appealing to me. One of the reasons I'm drawn to action figures is that many of them have excellent articulation and balance. This flexibility can come at a price, though--some of the figures I've purchased (like my Buffy the Vampire Slayer and Otaku figures) have unsightly joints and/or bizarre, exaggerated proportions. I also admire how action figures can have such realistic faces, and both my Daryl Dixon figure and Séverine's Avenger's Black Widow are great examples of this. With all of these things in mind, I set out to find a 1:6 scale action figure with a good blend of articulation and realism. WARNING: The realism of this doll might make some photographs inappropriate for the workplace or for young children. 1:6 scale seamless Super Flexible Phicen body with stainless steel skeleton, $105. I'd like to thank Emma for her suggestion that I take a look at the new Disney Store mini Animators' doll playsets. Not only is this a perfect suggestion for me (I love minis!) but it would have taken me ages to notice these new dolls on my own. I actually saw the mini dolls during one of my routine browsing days at Disney online, but passed them over because I assumed they were the larger 16-inch versions of the Animators' dolls--just with more accessories. Wrong! These little 5-inch dolls are a whole new thing completely, and they are definitely worth a look. 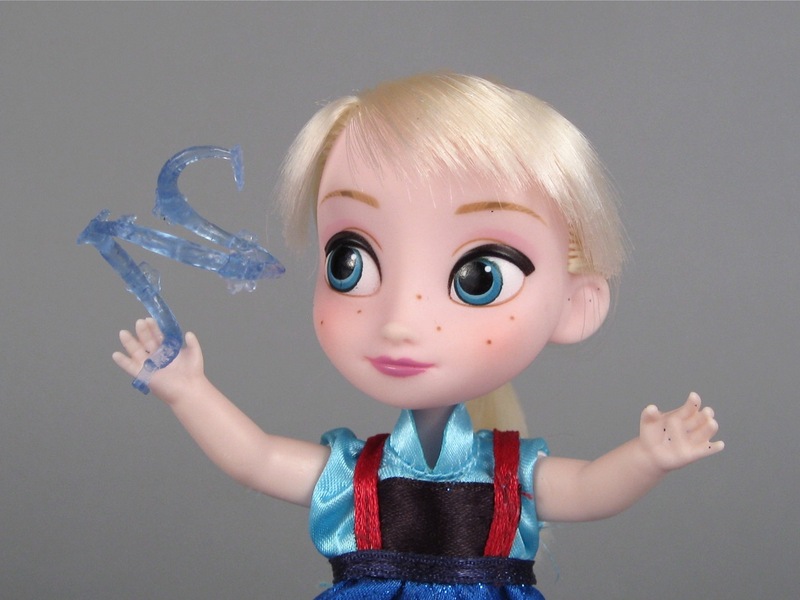 The first release of Animators' mini dolls includes Anna, Elsa, Cinderella, Ariel and Jasmine. All of these characters come with several cute movie-themed accessories. For example, Cinderella comes with a flocked Bruno (as a puppy), Gus and Jack the mice, and several smaller accessories. Ariel comes with Flounder, Sebastian, a glittery starfish, and a seahorse pulling a carriage. I was tempted by all of these sets, but ended up purchasing Elsa. I didn't intend to review yet another Frozen doll, but I found the mini Anna and Elsa to be the most appealing of these newcomers. Animators' mini Elsa doll from the Disney Store playset ($19.95). Monster Exchange "Lorna McNessie" and Haunted "Vandala Doubloons"
Before I start this review, I just want to say a quick word about my email inbox. I really love to get emails about the blog and recommendations for interesting dolls that I should look at. However, I have recently become overwhelmed by messages and can't find the time to give everyone the response they deserve. So, if you are waiting for a reply from me--I am so, so sorry for the long delay. I will do my best to get caught up soon, but there never seem to be enough hours in the day! One reason for my email ineptitude is that I spend way too much time photographing dolls. This review, for example, was meant to be just of Lorna McNessie--one of the new Monster High "Monster Exchange" dolls. However, when I was shopping for Lorna, the other new Monster High line, "Haunted," also caught my eye. I've had several requests to look at both of these new groups of dolls, so I figured I would try to do one of each in the same post. So...yeah. It's another long review. I'll start by taking a close look at Miss Lorna, whose red hair and Scottish ("Rottish") heritage was too much for me to resist--even for $23. I'll end the review by taking a slightly less in-depth look at Vandala Doubloons, the fancy, ethereal daughter of a pirate ghost. Monster Exchange "Lorna McNessie," $22.99. Happy New Year! I took an indulgent couple of weeks off to spend some time with my friends and family. It was a relatively doll-free holiday, dominated instead by lots of music, some new Legos, and a crowdfunded board game called Zombicide that has taken over my house. I highly recommend this game to zombie fans in the 13-and-up age range. It's one of the best games I've ever played. Anyway, I thought I'd start 2015 by showing you a special doll that I bought for myself about a year ago. She is a "Little Darling" 13-inch vinyl doll made by Dianna Effner and painted by Geri Uribe. Ms. Effner sculpts a variety of art dolls that are cast in vinyl and porcelain. She sells a few completed Little Darling dolls through her studio website and a variety of her sculptures are also available in kit form on the Expressions website. Ms. Effner is well known for her realistic face painting style, a technique that she has taught to several other artists over the years. Little Darling dolls hand-painted by Dianna Effner herself are highly sought after and quite valuable. They tend to sell on the secondary market for over $1,000. 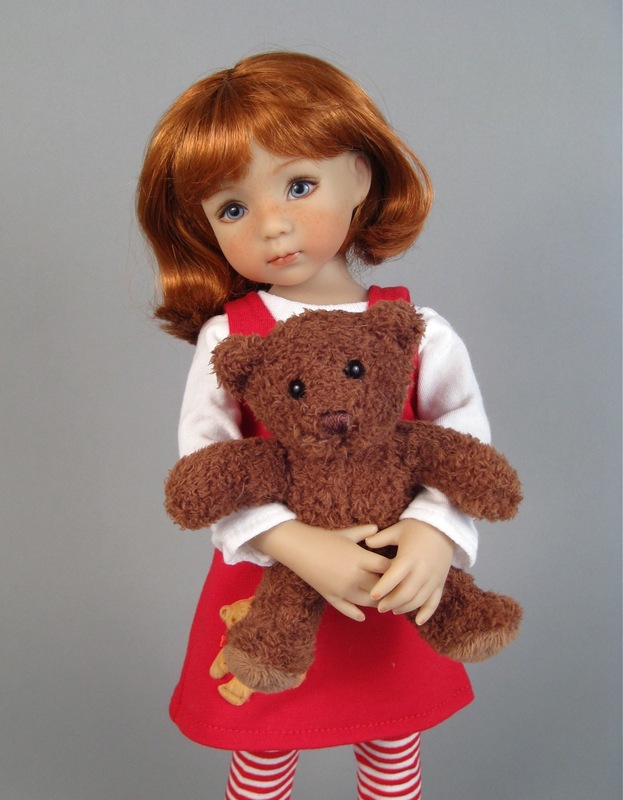 It is theoretically possible to get on a wait list to order a custom-painted doll directly from Ms Effner (for just under $400), but this list opens only sporadically and tends to close quickly. Dianna Effner Little Darling doll painted by Geri Uribe, $350.